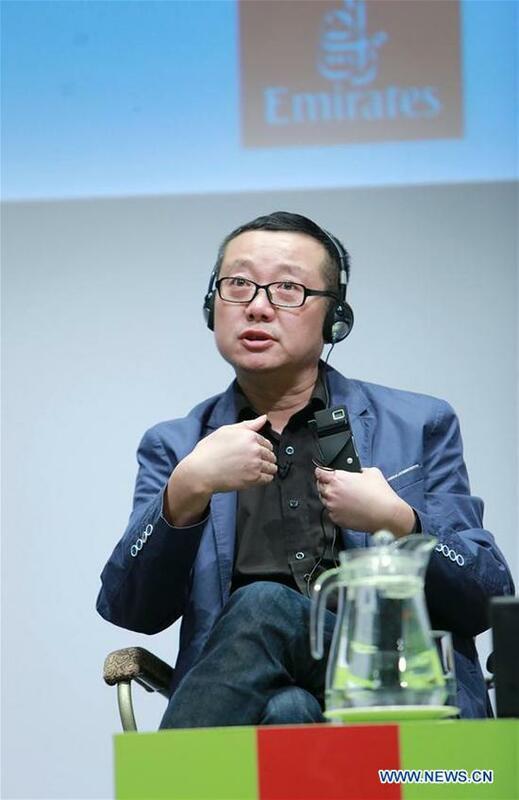 Liu Cixin, author of Chinese sci-fi bestseller "The Three-Body Problem," said here in an recent interview by Xinhua that science fiction "opens our minds to everything that we might see in the future." Liu came to Dubai to participate in the meeting with readers in Emirates Airline Festival of Literature during which the hall was filled up. Liu said that science fiction makes readers interested in science, especially young people, which broadens their horizons as well as promotes their imagination and creativity. Young readers should read various kinds of literature in order to find what they are truly interested in, he added. Liu noted that he has read a lot of works of Leo Tolstoy and Arthur Charles Clarke. "Reading all those books made what I am today." To gain international influence and recognition in the world, Chinese science fiction should involve good stories, expressing the irreplaceable part of science fiction to give foreign readers new experience, Liu said. Science fiction trilogy "The Three-Body Problem," which made Liu the first Asian writer to win the Hugo Award in 2015, has been translated into almost 20 different languages. "I hope that there will be an Arabic edition of 'The Three-Body Problem' in the near future," Liu said. Talking about the recent Chinese sci-fi hit film The Wandering Earth, which is based on a novella of the same name by Liu, he thought this success was mainly the result of diligent work of the movie's team. In Liu's view, the movie gains an unexpected success, but still has a big gap with the U.S. sci-fi movies in terms of technology and quality. "As the first Chinese sci-fi movie, I should say that it's very exciting and encouraging. I saw a lot of progress in special effects, sci-fi ideas and how to tell a story with Chinese sentiments and values," Liu said. Liu pointed out that though The Wandering Earth earned a success, it is impossible for Chinese sci-fi movies to copy the same way with big investment and producing. He expected that the Chinese sci-fi movies will be more diverse in the future. "But now we lack a complete industry of sci-fi movies ... we also lack specialists in special effects and screenwriters of sci-fi field," he added. Liu considered that sci-fi movies will have a bright future especially in China where such movies will likely flourish. However, Liu thought science fiction's future is gloomy. He said the reasons may be complicated. The reality is that the number of readers and writers are decreasing and there is a lack of influential sci-fi books as well. "Science fiction just displays all kinds of possibilities in the future. As for which possibilities will come true, it can not be predicted by sci-fi writers," the Chinese writer said.